These bars are a revelation. Yes, they are that good. My resolution for 2011 is to start being more obvious about recipes that are my staples. This is one of them. I'm giving up the secrets with this one, so promise me you'll try this. 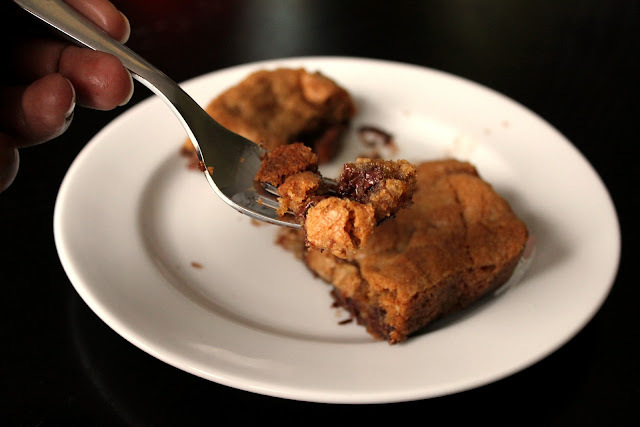 The basis of this cookie bar recipe is the the chocolate chip cookie recipe that I've adapted over the past 10 years or so and that my husband claims is the reason he married me. I spoiled him with batches of these cookies (and my Coconut Pound Cake) while we were dating. I can resist most of my own baked goods, but these cookies are the exception. When they are warm and the chocolate is melting all over the place I'm ready to attack the whole plate and chase it with a cold glass of milk or a cup of coffee. Until this week I always made this recipe in traditional cookie form, but then I noticed that some food bloggers were making chocolate chip cookies as bars and I decided to try this technique with my classic recipe. Not only is it easier to make cookie bars, but the cookies end up being thicker, chewier, and less labor intensive to bake. They're also more durable for storage and travel and dare I say they actually taste better. I'm sold on this method. 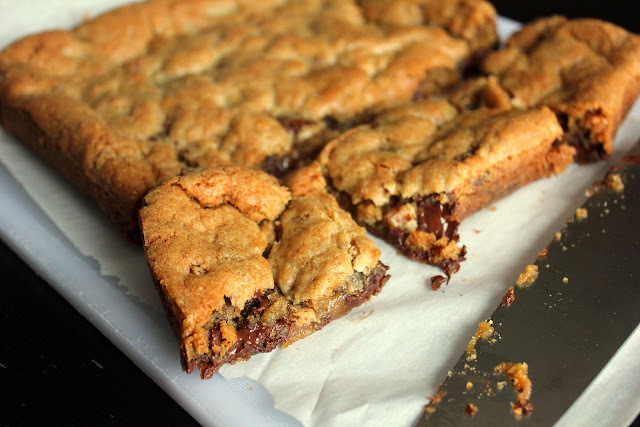 The dough is a chocolate chip cookie dough that relies on semisweet chocolate chunks instead of chips to provide bigger bursts of chocolate in every bite. It also has more brown sugar than white sugar to have a chewier bite. My secret ingredients are toffee bits (which you should be able to find in the baking aisle of a well-stocked grocery store) and chopped nuts. I don't even love nuts in baked goods, but they work perfectly in this cookie. Trust me. It all works out. Everyone will be happy. Once you make the dough, you can let it sit for up to three days before you bake it. Some recipe writers swear that cookie dough is best if left to "marinate" for a few days in the fridge before baking. I couldn't wait, so I did a half batch immediately and baked the other half a few days later. Do what you've gotta do. Cut the cookie bars into squares and try not to eat them all in one serving. If you have leftovers, just store them in a cookie tin or similar airtight container. If you're really into the melted chocolate thing (I am! ), pop cooled cookies into the microwave for 15 seconds before eating. These cookie bars are too delicious. Please make them for someone you love. Preheat oven to 350 degrees. Line a 9 by 12 inch baking pan (or two 8 by 8 inch baking pans) with parchment paper. Sift together flour, salt (if using), baking powder, and baking soda. Set aside. In the bowl of a stand mixer (or with a hand-held mixer) whip together butter, sugar, brown sugar, and vanilla until light and fluffy. Mix in eggs, one at a time. Gradually beat flour into butter mixture. Once flour is incorporated, slowly mix in chocolate chunks, nuts, and toffee. At this stage you can put the dough in the fridge for up to three days, or you can continue with the recipe. Press dough into the prepared baking pans. Dough should be about 3/4" thick and compacted into the pan. Bake for 30-35 minutes or until golden brown. The dough will be soft in some spots when finished, but it will firm up once it cools. Let the bars cool in the pan for at least 45 minutes before removing the entire sheet of the bars from the pan, cutting into squares, and serving. I just made chocolate chip cookies, but now I want these! 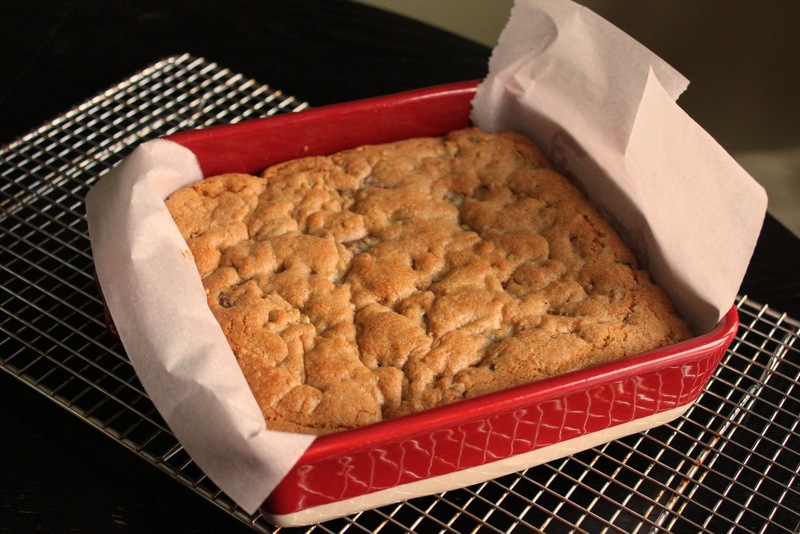 Your cookie bars look great in your new bakeware.